Bat Dan Pho (Noddle), steamed rolled rice pancake on Hang Ga street, roasted birds on Ta Hien... are the familiar and trusted names for culinary devotees in Hanoi capital. 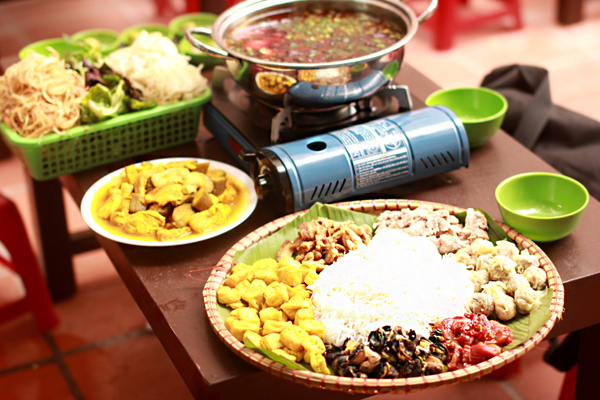 There are foods associated with street names, then when craving for food, or when wanting to introduce to their friends about the typical foods of Hanoi, people have a place to remember. The cold and the incessant rains of the winter suddenly make you think of the hot dishes, just blowing and tasting. In the diverse and colorful world of hot pot, snail hot pot sounds rustic and seems to be strange to many people. But with people of Hanoi, Ms. Luong hotpot restaurant located on a small alley on Khuong Thuong street has been a familiar address for lovers of snails, contributed to enriching the menu of hot pots in the capital city. Not only in cold days do people come to this restaurant to taste hot pot, the restaurant also sells the equally attractive and delicious dishes which are all made from snails such as snail noodles, grilled chopped snails wrapped in lốt leaves, snail rolls ... With students, the price is a little bit expensive here, but in the meetings, a snail hotpot for 6 people rating from 600,000 to 800,000 VND will make you completely satisfied. 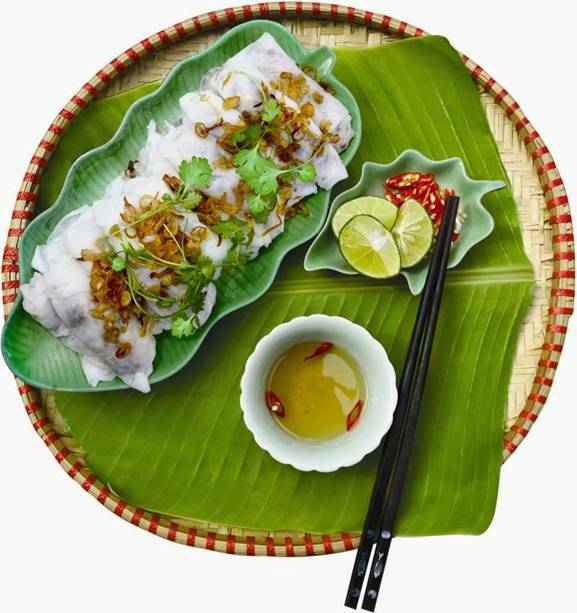 One of the most famous places serving rolled rice pancakes in Hanoi is Thanh Van restaurant at 14 Hang Ga street. Opened dozen years ago, this is an incredibly familiar address of people in the old quarter, and is the ideal destination to welcome international friends and introduce the culinary culture of Vietnam. The cakes are thin, soft and perhaps only in Hanoi that the stuffing is chicken mixed with black mushrooms (cat’s ear). Dried onions are also homemade, so they are crispy, not dry but very aromatic However, this is also one of the most expensive restaurant in Hanoi, with the price of 35,000 VND/ ration. Pho is the name attached to Hanoi, it is not just the food, it is also the beauty and subtlety of Vietnamese culinary culture in the eyes of international friends. 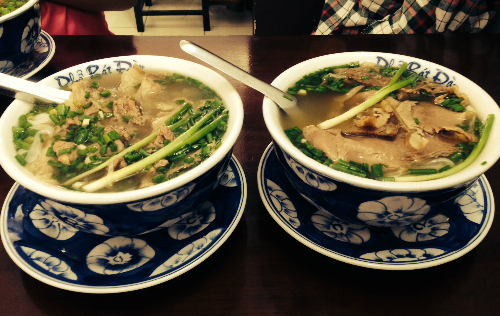 Referring to Pho, Bat Dan is the name which has made people think of first for over 50 years. Eating Bat Dan Pho, people really see the mind of the chef, what is more, in which they find the traditional flavor of Hanoi cuisine a long time ago. Those who live far from their homeland often remember Hanoi with Bat Dan pho with gently sweet broth and the aroma of stewed beef bones, soft noodles and the special beef characterizing the Vietnamese flavor. 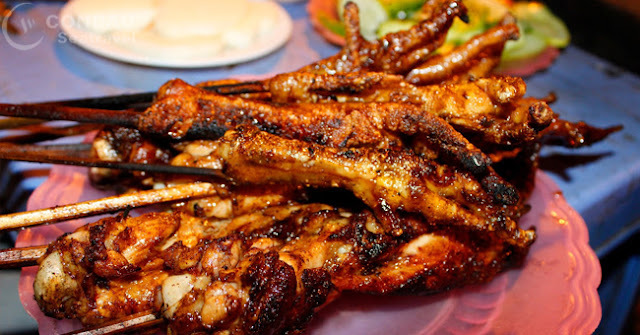 Grilled chicken feet is a very interesting nosh, a snack. In Hanoi, the most famous and the oldest place selling grilled chicken feet is Ly Van Phuc Street (a small street on Nguyen Thai Hoc road). Grilled chicken wings and feet are fragrant, the attractive smells make anyone accidentally crossing can not refuse. The feeling of sipping a grilled chicken foot a cold day is very interesting. With around 50,000 VND/person, you can have a happy grilled chicken feet party with your friends.